That’s a question that I have pondered for more than 15 years, visiting and reading about places broken after long slow declines—from vacant lots in New York and Bangalore to the Los Angeles River—as well as places broken by sudden disasters like New Orleans after Hurricane Katrina, and Japan after the 2011 earthquake. I first became inspired by efforts to fix broken places in 1998, when I visited what had been a bus parking lot contaminated by diesel oil on Manhattan’s Lower East Side. Local activists had converted the parking lot into a community garden. On one side of the garden was a school. The children had built a greenhouse in the garden, heated by compost generated from orange pulp, banana peels, and other waste they collected from a nearby juice bar. On the other side of the garden was a mosque, whose Bangladeshi worshippers in kurtas tended to beds of amaranth, pigeon peas, marigold, and coriander. This garden on the Lower East Side showed me how it’s done. To reclaim a broken place, people from disparate walks of life need to work together. They also need to recognize the multiple benefits that a broken place can hold. Revivals inspired by grassroots activism often grow into something bigger than the original organizers imagined. I love strolling the High Line park in New York—a place that started as a campaign by two West Side residents to restore a dilapidated elevated rail line in the Meatpacking District, and has become one of the world’s most heavily designed, endowed, and visited public spaces. But sometimes broken places are reclaimed without the involvement of well-known figures like MacAdams or Gehry. Take India. 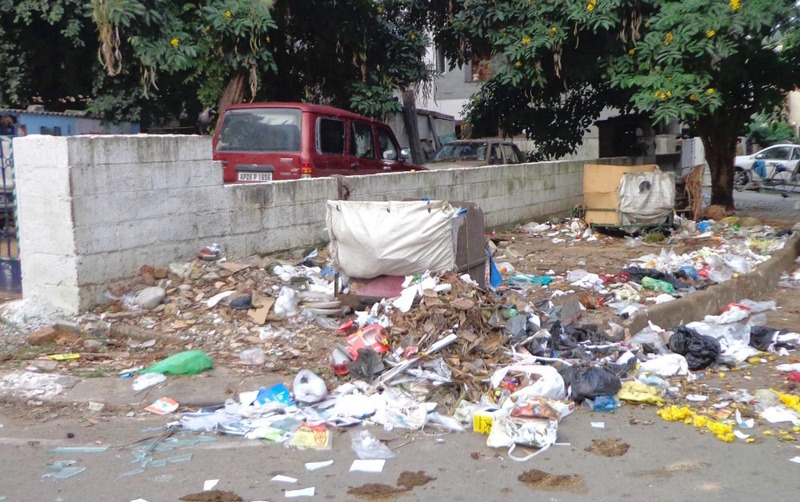 A group called The Ugly Indian was launched in Bangalore, India, in 2010, when everyday citizens decided they could no longer tolerate desecration of their city’s public spaces by trash and human defecation. 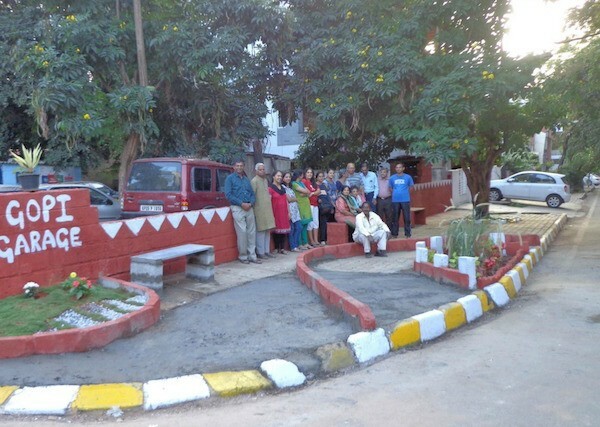 The group organized volunteers for what became known as a “spotfix”—an effort to pick up garbage and install pathways, planters, trash bins, and no-smell urinals in what had been a smelly, ugly space along a city street in Bangalore. These volunteers remained anonymous so that no one person would grab the credit for transforming rubbish and stench into a public space people could enjoy. The Ugly Indian at work. This is the same street corner pictured at the top of this article. The Ugly Indian started with one cleanup in Bangalore, and spread to hundreds of spotfixes across India and now Pakistan. How? The Ugly Indian cleverly exploits traditional and modern Indian culture. The organizers invite housemaids—the very ones who take out the trash and dump it in public spaces—to create traditional rice flour drawings on the spotfix sites for people to enjoy. And since housemaids are part of the community (in India, housekeeping help is common in most households), having them participate creates more respect among neighbors in keeping the public spaces clean over the long-term. Behind the volunteers who take part in spotfixes is a group of anonymous designers and tech-savvy millennials who contribute their expertise to The Ugly Indian. They have designed no-odor urinals and trash bins suitable for public spaces. They figured out that painting walls a maroon color would cover the statins of betel nut spit without provoking tensions among India’s different ethnic groups, which consider maroon a neutral color. The anonymous professionals and volunteers behind The Ugly Indian are structural and social architects—not of Gehry’s stature and not public figures like MacAdams—but architects nevertheless. It doesn’t take a star to convert trashed-out places to community spaces. But it does take people with all kinds of talents who can figure out how to work together to reclaim broken places. Marianne Krasny is a professor and director of the Civic Ecology Lab at Cornell University. She teaches the Reclaiming Broken Places MOOC and is a Public Voices Fellow. Her most recent book is Civic Ecology: Adaptation and Transformation from the Ground Up (with Keith G. Tidball). *Photos courtesy of The Ugly Indian.